"there is no reason to choose this airline"
✅ Verified Review | Flew Bulgaria Air from Tel Aviv to Varna and return. 4 hours delay, every hour they updated with another delay. Old aircraft and bad service. Once we arrived to the aircraft we spent another 30 minutes without air conditioning. Unless the price is very low comparing the rest there is no reason to choose this airline. "do not buy tickets from this airline"
✅ Verified Review | Sofia to Barcelona. I strongly recommend that you do not buy tickets from this airline. I was supposed to fly from Sofia to Barcelona today, June 27 2017, leaving Sofia at 10 am, arriving 12 pm. As of now, 4:20 pm, there is no information at all when the flight would leave, where is the plane currently, and whether it will leave at all. The electronic board simply says the flight is delayed, the person at the gate says there is no information available to him, and the web cite of Bulgaria air does not mention the flight at all under "flight status". The personel at the gate is supposed to at least provide water and snacks to the passengers waiting all day, but every time we tried to approach them, they said that we should wait to be called for food, not go and ask for it... We ended up visiting the airport restaurant for breakfast, lunch, and we are headed there for dinner as well since no one knows when or if the flight will leave. We asked if we can be rebooked to RyanAir, which also had a direct flight to Barcelona one hour later at 3:55 pm - we had no checked in luggage and the flight was already delayed 5 hours but the customer service representative was very rude and told me that the airline does not do that, we just have to keep waiting. In the meanwhile, significant delayed were announced over the loud speaker for several other Bulgaria Air flights. All Ryanair flights, on the other hand, were on time. ✅ Verified Review | Flew from Sofia to Paris. 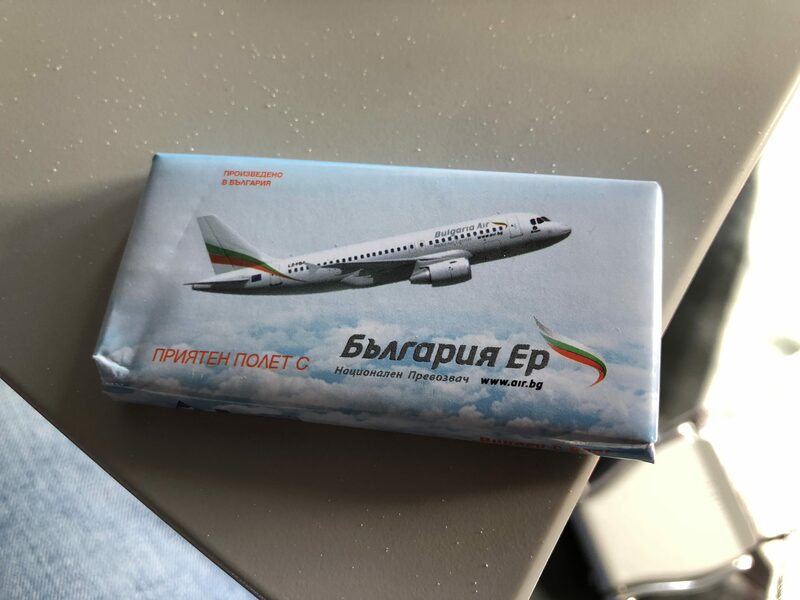 The Embraer planes of Bulgaria Air are okay. The seats are pretty old but the spacing is okay. The airbus planes are worse. The seats are older (rubbed off leather, torn pouches etc) and the spacing is uncomfortably tight. Cabin service is okay. Food is pretty simple but the staff are usually quick. There is no onboard entertainment on any of the planes. ✅ Verified Review | I was flying Business Class from Sofia to Frankfurt. I wasn't offered welcome drink and the so called 'food' is a miserable sandwich - same one offered in Economy. What's funny is that Economy gets bottles of water on their seats and Business didn't! Ridiculous. The chocolate is not edible. In Sofia we boarded a bus to take us to the airplane, which is unpleasant. In Frankfurt we landed so far away from the gates, we travelled 20 minutes by bus! Don't fly Business Class with this airline. "the flight was very pleasant"
✅ Verified Review | Varna to Sofia. Very nice flight. Business class check in was very slow - first it opened 1h 30mins before the flight and then the computer stopped working, so waited there for about 25 minutes. The lounge in Varna is great, I believe the best one in Bulgaria. The business class cabin was totally full - 8 seats, as well as economy class. They didn't offer welcome drinks, not like my previous flights on the Bulgaria Air business class. The seats are comfortable and also a little bit wider then the economy ones. The food was a cold beverage, but was tasty. The flight landed on time. Overall, the flight was very pleasant. Sofia to Brussels with Bulgaria Air. The check-in line at Sofia Airport was long, but it moved quickly, as did the security check. Staff was courteous and efficient. Upon entering the plane, we were given a bottle of water, which was later followed by a sandwich and a choice of hot and cold beverages. We left on time and arrived at our destination on time. Cabin staff was friendly and professional. An easy, enjoyable flight. 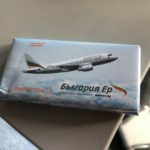 ✅ Verified Review | I flew Bulgaria Air E190 from Sofia to Varna two weeks ago. The seat was Ok, the only food - chocolate - also, the service, a little bit slow, but overall was good. The flight was 30 minutes late and they made us get out of the plane and sit in the bus because they had to do a check. "No complaints with Bulgaria Air"
FB431 on 30 June from Sofia to Paris CDG. Check-in lines were long but for baggage drop it was quicker and they let you use the Business Class counter. Bag tagged to Paris and thru security and immigration to the gate. Boarding was via bus on the tarmac - strange as only 3 of the 10+ jet bridges were occupied. 2 buses filled up the plane. Greeted upon boarding and the attendants checked everyone boarding pass. Bottle of water in the seat for each passenger. Departed on-time and smooth flight. Drink service 2 x and a snack provided (similar to the DUS-SOF flight I was on a few days earlier). Landed on-time in Paris and off the plane quickly - bags took a bit long but overall good flight. No complaints with Bulgaria Air - very nice service and on-time flights for a good price. "nice welcome from flight crew"
Dusseldorf to Sofia on 28 July. Online check-in is available but on their webpage is says it isn't from DUS - but it was and got my seat and BP quickly. Checked my bag at the counter - friendly agent but she was from an airport company - not Bulgaria air. Boarded by bus - full plane but people were organized and no pushing. Nice welcome from flight crew; bottle of water for each passenger was already in their seat. Departed on-time. Seat comfort is perfect - plenty of knee-room. 2 hour 30 min flight and was served a turkey and cheese sandwich, chocolate and a drink run. No in-flight entertainment but was watching my DVD's so didn't matter. Landed on time and jet-bridge into the terminal (which is new and easy to naviagate). Immigration was quick and friendly and bags were on the belt soon. Good flight! ✅ Verified Review | Another pleasant flight with Bulgaria Air from Varna to Sofia. It's a regional airline, but still very good. I liked how nice the cabin crew were and how professional the pilots were. The food was not so nice, it was just a snack. Otherwise I like the airline and I recommend it.